To make a logo smart, it’s necessary to obey simple logo design principles. 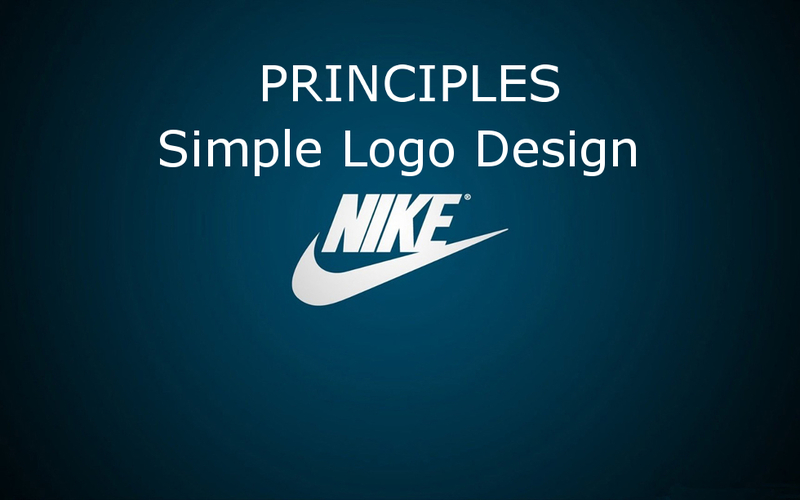 Here we use Nike logo as a classic example, providing 6 rules in logo design. Taking a rapid overview of all brilliant logos, we can hardly find out a single logo in a complicated layout. Simple logo design takes unshakable dominance. Instant recognition by audiences is essential for a logo, which requires simplicity in its design. Today, we are about to study effective logo design with Nike logo. It’s impossible to simplify Nike logo once more. It uses a right check and four finest letters. "Nike" pronounces like "like", which means passion. "N" stands for new force, or new member being in a new place. A check below means it’s in the right direction. Passion and fearlessness make a new man successful. It can’t be more concise. Everybody understands the spirit when sees it. Logo speaks for all Nike corporation pursuits. Nike, as a good logo, simplifies to the best. Simplest strategy has become the mainstream in the new era. From brand to logo, from app to website, Nike insists on using Simplism to display its essences. Back to your commodity or brand, simple logo design method shall work well for you as well. Just blend letters and graphics in a nice look, your logo can’t be bad. Below are 6 simple logo design principles, you may find them useful when creating a logo full of creativity and inspirations. Various web & app design styles are based on these principles. Most Simplism logos use black and white hue, like Nike logo does, since B&W color style makes people feel real naturally. B&W is an ideal nesting place to start creating a logo. We suggest you begin logo design process in Black and White. Though colors do play a vital role in some case, it isn’t everything. A good designer NEVER puts colors first. Let's say you want to add colors and show warms or other feelings in logo, it's advised to apply colors after a satisfying combination of elements. If logo is ugly in B&W, painting it colorfully won’t make it any better. Only after a good buildup of each element in B&W can we finish a brilliant logo with color painting and other post-processing. In this way, logo is enough to show your high spirits. Constantly thinking twice on how logo elements assembled by wild thinking is a good habit. Turning all kinds of ideas into logo curves always makes a difference. Logo curves and shapes are just like signatures, which stand for a person, or a brand. The letters, curves and shapes altogether help viewers memorize the logo. Everything in the logo plays a part in user identification. Your ideas are the prior thing to make your logo stand out. It’s a good strategy to add your hand drawings or other creative elements into your logo. Logos usually look like a piece of art when this strategy is applied in design. Isolated from photos or grain elements, logo impression can be deeper. Therefore, this method is popular as a preferable choice. 1) Finalize Catchwords: Despite flat text logo is widely used in simple logo design, we suggest you innovating simple text logo on your own. If your brand or product has only a name, it shows no meaning or spirits. Then you’d be better off thinking outside the box and adding some inspirations to your text logo design. Focus on logo text and create a unique catchword in accordance with its style and spirits. 2) Use A Nice Font: English letters are related to geometry. The style of letter varies much. Fonts for logo design play a vital part in styles. So we often see fashion text, retro text, wired curved text in effective logo design. They all look great in various fonts. Once you are willing to spend time in those fonts, the best font on logo text for your design will be found eventually. Tips: To download free fonts to design a logo, please refer to fontspace.com, 1001fonts.com, dafont.com or cooltext.com. After finding the font that suits for your logo design style, you should nicely mix and adjust other elements to ensure them look fantastic, vivid and valuable together. There is no rule to limit in how curves and lines go. Merely using the product logo as its brand logo is a widely acknowledged strategy. Simplism isn’t a brand-new idea, in fact, it has existed for a long time. To some extent, Simplism itself is a part of the retro. Let alone designing logo, solely mixing some retro elements, you will know that retro is Simplism somehow. The Retro Simplism style tends to use a simple font and clear line drawings, e.g. Marginal letters lie around a circle as a simple logo design. A key feature is its slim lines and slim drawings. Retro color scheme is powerful if used properly. The feeling of Retro scheme that gave us is strong. Its advantage is that it allows you to choose the concept and use different old styles. Logo will be perfect in a century color scheme as long as you can handle colors well. Geometry graphics is best to be recognized. When you are about to make a simple logo design, a begin of utilizing the basic graphics is good. Geometry graphics not only constitutes logo, but also transmits message and communicate with customers. -Circle/Ring: Ring is a classical meaning of sports. Circle and ring are always connected with female, love, energy, strength, the unlimited and harmony. -Square: As the most commonly seen shape in our daily life, it stands for rules and equality. It makes us feel stable and trustworthy. -Triangle: It shows steadiness and energy in the positive side. On the contrary, it speaks for conflicts, tension, and uneasiness in upside down direction. -Cross: Religion uses it frequently. Also, it carries a meaning of health and peace. It’s the last but most important advice. That is, we should never beautify logo too much when designing a simple logo. To have a creative and simple logo design, there are piles of ways to do it. However, a wonderful impression that a logo leaves will come to an end when we prepare to beautify it well. In order to to get a smart logo, we just need to adopt the opposite ploy: instead of adding beauty, we try to delete unnecessary elements and make logo simple. It’s best to apply flat design strategy to create an intuitive and simple logo with no redundant message. A famous designer ever puts: "A real simple logo design can be drawn with a pencil swiftly. Namely, if you can put a pencil in paper to outline it once and for all, the logo is simple enough." Of course, it isn’t always feasible to test all simple logos, however, it gives us a way to look at our logo. Simplism strategy makes a logo live long. In some sense, a fine Simplism logo enjoys an eternal beauty. A fine simple logo shares its spirits with all users and inspires its users, which makes the logo eternal. It well explains why Nike logo remains the same in decades. It’s easier to recall and empathize a Simplism logo for users. A good simple logo design survives finally when time flies.